But the politics dominating the movement against the Agreement, unfortunately, is the opposite of this kind of internationalist solidarity. Instead, it’s a variety of nationalism, with the nationalism getting amplified as the years go on. There were New Zealand flags all over the rally in Wellington today. Advertisements stressed again and again how these marches were for ‘Kiwis concerned about the TPPA.’ Speakers went so far as to praise New Zealand First for their opposition, and to peddle all sorts of illusions in ‘nice’, little, tidy New Zealand capitalism with, as the It’s Our Future website puts it, ‘our innovative economy’ and ‘our pristine environment’. This is all part of the ‘muck of ages’, the reactionary ideas working people and the oppressed need to shake off if we’re to win our own liberation. Who is the ‘our’ of ‘It’s Our Future’? Are Fonterra, a New Zealand company, committed to a pristine environment? Is ‘our’ land the same for Māori dispossesed from their land as it is for wealthy farmers? What about the flag? What place does this symbol of imperialism and colonialism have on a march for workers’ rights? 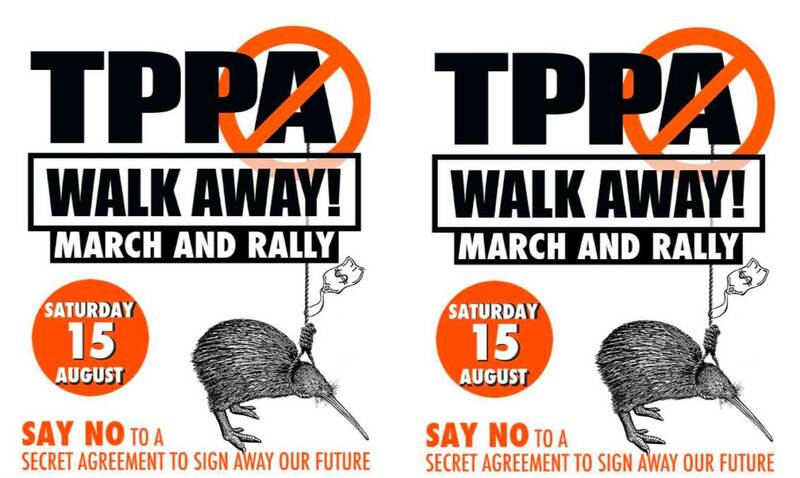 Instead of encouraging us to look to forge solidarity with workers battling the TPP elsewhere, all this talk of ‘ordinary Kiwis’ and the emphasis on ‘our’ sovereignty fosters a toxic nationalism. That’s not to say that the protest organisers themselves hold reactionary views. Many of them are dedicated anti-racists and trade unionists. But this choice of rhetoric and ‘nice New Zealand’ nationalism has consequences. It’s significant, for example, that in Wellington a man wearing anti-Semitic costume and holding a homophobic sign felt welcome taking part in the event. (Anti-Semitic caricatures of John Key have featured in previous crowds too). When he was challenged by ISO and other women and LGBTI young people, moreover, protest marshalls pleaded helplessness. New Zealand First – party of openly anti-Asian racism – is praised at rallies. 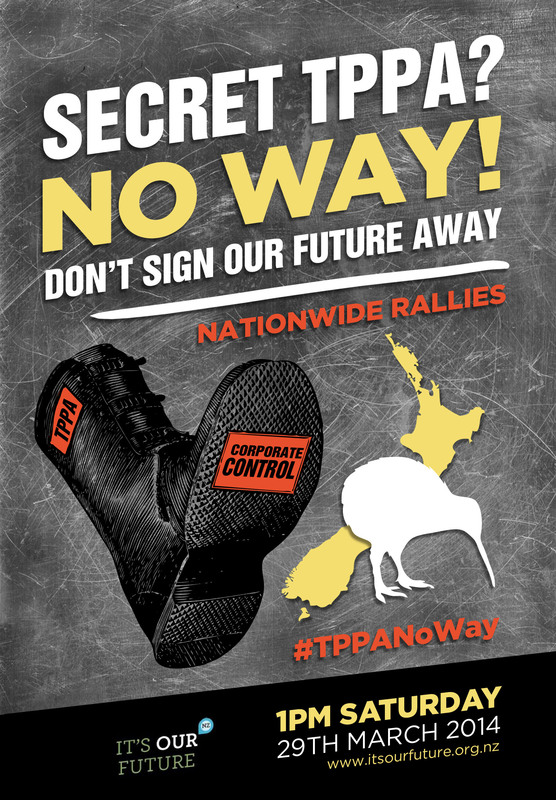 The TPPA represents a real threat to our rights – and ‘our’ rights are the rights of workers across the globe. So we need to step up our opposition, but recognise also that this opposition involves a struggle within our own movement against the nationalist and reactionary ideas that will hold us back.